If you love your wine then you will love these fantastic wine fridges and coolers that are ideal for keeping your favourite bottles at just the right temperature. We review and guide you to the wine fridges that you should look at from the the small to large. A fantastic wine fridge, will display and keep cool 34 wine bottles and looks stunning. A great cooler at a really good price. 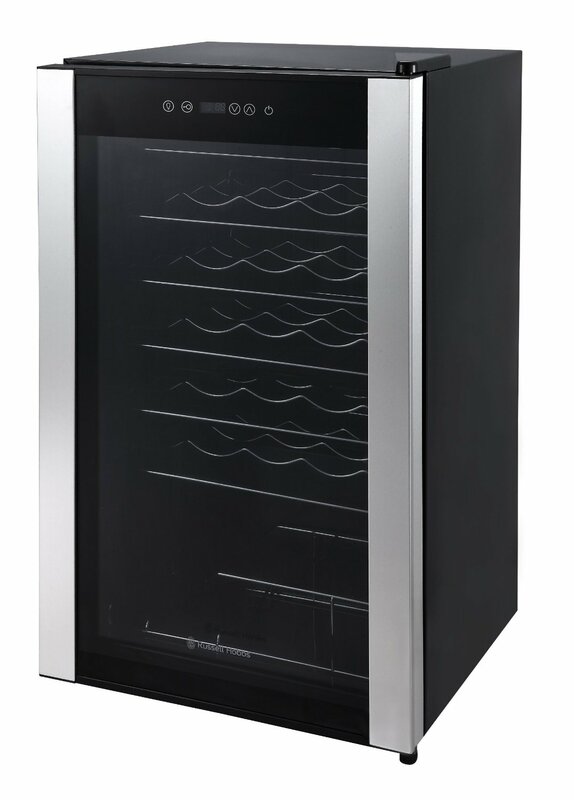 A quality and stylish looking wine fridge with dual zone compartments with there own temperature settings. Holding up to 24 bottles it is ideal for most people. A stylish looking fridge holding 32 bottles between 2 zones. Great if you want dual temperature zones and fits nicely under most kitchen worktop counters. So you have bought some wine that you’re not planning on drinking right away. Now what do you do with it? Following a few simple guidelines should keep your wines safe until you’re ready to drink them. Keep them cool but not too cool. 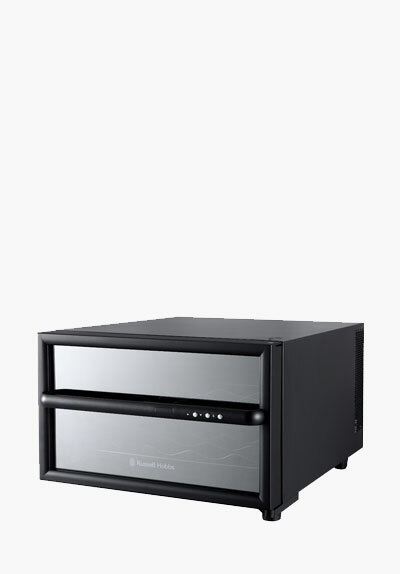 For that you need to buy a wine cooler which can store your wine at their desired temperature. Heat is the biggest enemy for wine. Temperatures above 70° F will age a wine more quickly than is usually desirable or your wine may result in flat aromas and flavor. The ideal temperature range is between 45° F and 65° F (and 55° F is often considered the best temperature). Wide fluctuation in temperature will damage the wine and the cork. Ideal range of temperature for storing red wine is 50-55ºF or 10-16ºC. White wines can be stored at lower ranges at 45ºF. Before buying a new wine cooler, you will need to consider other points too such as the type of wine you want to chill, the available space you have for the cooler and your storage capacity. Your geographical location and the surrounding temperature of the room where you will place your cooler. Plus, is the cooler esthetically going with the ambiance of the room or not. A single-zone refrigerator is self-explanatory; it has a single temperature sensor and temperature setting for the entire cooler. This is good for chilling single type of wine. A dual-zone refrigerator on the other hand has independent temperature controls and displays for each zone and will have a twenty degree differential from top to bottom (i.e. 45 – 65°F).Thus good for storing different types of wine. So a dual cooler is more preferred. Go for a wine cooler that has humidity control. Ideal humidity for wine storage ranges from 70-75%.Higher or lower than this will ruin the taste of wine. While buying a wine cooler go for the one that have doors with UV protection. Damage from UV radiation is most likely to occur in a short period of time (hours), so UV protection is necessary, and the more the better. Prefer a Thermoelectric Coolers over compressor type because firstly no moving parts means no vibration and silent operation. 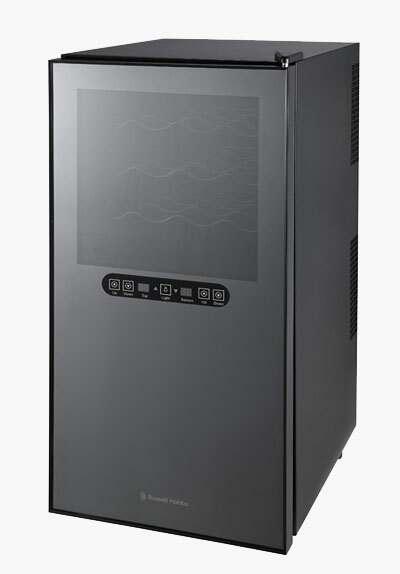 With a compressor-based wine cooler you can hear the compressor cycling on and off and you can hear refrigerant circulating, resulting in unwanted noise. Secondly no moving parts mean less maintenance. They are more environment friendly as they contain no CFC’s (refrigerant). They are also lightweight and use less energy. They don’t cycle on and off so they have smaller temperature fluctuations. This means that thermoelectric should last longer and be more reliable. In order to determine the best wine refrigerator or cooler you need to know what a wine refrigerator is and what it isn’t. A wine cellar is not a wine cooler. A wine cooler stores the wine for a short period of time at optimum temperature which range from 40 to 65°F depending on the type of wine you want to store or chill. On the other hand a wine cellar purpose is long-term storage and is designed as such which keeps the wine at its aging temperature i.e. 55°F for all wines, with 70% humidity and protection against UV light, temperature fluctuations and vibrations. Depends either you want to go for a single zone cooling or double zone. Single zone coolers only have one cooling area and one temperature control. While in Dual zone wine coolers there is a temperature range available so that you can store both red and white wine, but they are a little more expensive. The primary function of a wine cooler is to chill wine to proper serving temperatures. So, a good wine refrigerator should have a decent temperature range, at least 45 – 65°F. Serving temperature for different wines are as follow: Champagne: 50-52°F, Most whites: 55-60°F, Lighter reds: 62-65°F, Medium & heavy reds: 65-68°F. 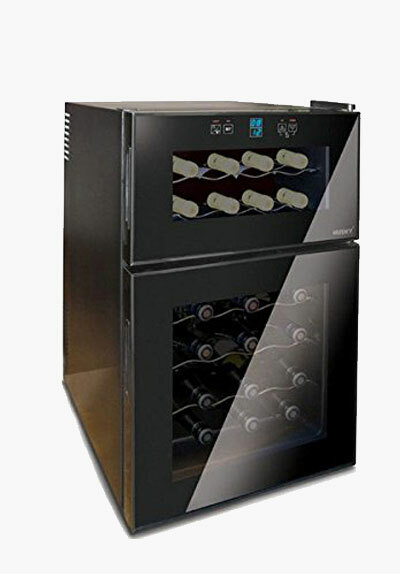 All compressor-type wine fridges vibrate to some extent. Opinion is divided on whether or not the vibration affects the quality of wine but on other hand they are more suited for hot weather. Manufacturers claim thermoelectric fridges are better at providing consistent and controlled temperatures, but they are more costly. The thermoelectric cooling system claims to be vibration free, but vibration still occurs (to a lesser extent) because of the fan. Consider a cooler with wooden shelves over the ones with metal shelving, which makes it harder to pull out your wines and can scratch bottles or labels .also keep in mind that the shelves are suited for all shapes and sizes of wine bottles. LED lights, locks and easy to find replacement parts are also factors to be pondered upon before buying a wine cooler. Whether you buy wine to drink today, tomorrow, next week or next month storage should be a priority. Even your cheap and cheerful bottles of fizz have an optimum temperature for storage so they can be enjoyed at their best. If you are a serious wine drinker and tend to store your favourite tipple in a wine rack or in the fridge, here a look at some of the most popular types of wine fridges around today. Once you have tasted wine at its ideal temperature you will really be able to tell the difference. Small, neat and designed to store a small amount of wine for a relatively short time coolers are the cheapest of all the wine fridges. They come in various shapes and sizes and generally store between 6 and 18 bottle of wine. Those who are taking their first foray into serious wine drinking but who don’t want to store a collection for a long period of time will benefit from having one of these in the home. These do what they say on the tin. Designed to fit under your kitchen work counter, or any counter for that matter, these are the most popular models. Very similar visually to those fridges you see behind a bar, these models will have several shelves and carry larger quantities of wine that your standard cooler. They will usually have one large glass door so your bottles are on view and are perfect if you like to buy your wine in bulk and relax in the knowledge it will still be in perfect condition 6 months down the line. The ultimate socialite accessory, with one of these bad boys you will always have wine and beverages on hand for whenever anyone decides to call round. Perfect for having outside in a barbecue area, you can store wine, beer, soft drinks anything you like. If it’s been decided that everyone is going back to yours after the pub then you need never panic about having to serve warm beer or wine. The problem is once its known you’ve got one of these you could well end up having an impromptu party more evenings than not. Looking at one of these wine fridges you would never guess what was hidden within until you open the door, or doors. For all the world it just looks like a smart piece of furniture to blend in with your décor, and whether you prefer the traditional look or a more contemporary styling there will be one that suits you. The refrigeration area is completely encased in a wooden surround in a variety of colours and design. There are plain doors, patterned doors and even lattice work doors that allow it to blend in seamlessly with any décor. If you are a wine lover who doesn’t really want your wine collection on show to everyone then this is the perfect solution. It’s funny isn’t it? All winter we bemoan the weather and yearn for the summer but the arrival of the heat never fails to catch us by surprise. This happens every year without fail an not only does the heat take its toll on us it does nothing for our wine either! Very few people in the UK have air con in their homes, it simply isn’t needed, so where do we put those bottles of wine that the heat can destroy wherever we store them? Many of you know will be answering “the fridge” ; sorry but no. Whether you are storing red or white wine, Champagne, Port or whatever the optimum storage temperature is 55°. When you fiddle with the little knob on the fridge you have no idea what temperature any of those numbers equate too. An ordinary fridge will be too cold and that pretty wine rack is no good either as room temperature in the summer is just too hot. If you have no choice in the matter a fridge is the lesser of two evils but only for a short length of time as being stored at a temperature less than 55° will still have an adverse effect on the contents of those precious bottles. The solution is, of course, to invest in a in one of the numerous options now available for wine storage. Whatever size your collection, or budget, may be you will find a solution to fit your needs. There are the small wine fridges, or coolers, which are ideal for holding anything from a few bottles up to a few cases. As most of these now are eco-friendly thermoelectric models they are very quiet and thus can be used anywhere in the house. If you want something a bit bigger then a wine fridge with has both compressor and a vent at the front, much like you will find in your kitchen. These can be both free standing and be incorporated into your existing kitchen or your bar area. If these option don’t seem big or bold enough for your taste, and you want to store your wine in a way that really has the wow factor then this next option could tick all your boxes. Step forward the free standing wine cellar. There are far too many brands and designs to name them all here but suffice to say there is one for everyone. In fairness some are just larger versions that those above but some, such as the models made by Eurocave really are wine cellars without any of the planning, digging and toil needed to create a bone fide one under your home. These models have been designed to replicate the conditions of a traditional French wine cellar caves, and who are we to argue with a country that has produced some of the world’s top wines for centuries? You literally can store your wine for decades in these bad boys and these are the real deal for those wine collectors for whom it has gone past a hobby into something bordering on obsession.